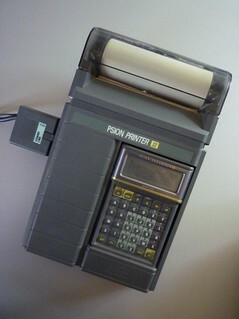 The Psion Printer II was a thermal printer with a built in rechargeable battery pack into which a Psion Organiser II could be inserted. The Organiser's top port was carried through to a port on the left hand side allowing for connection of accessories such as the Comms Link. Here is a picture of the LZ64 out of the printer.